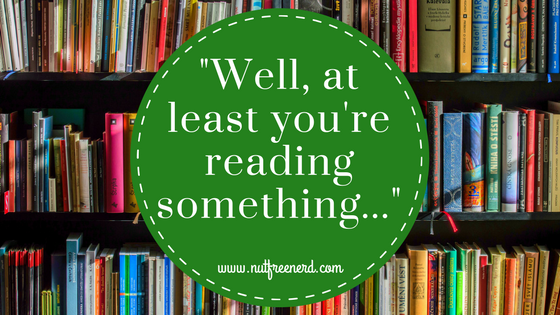 Have you ever heard someone say to someone else: “Well, at least you’re reading something…“? I’ve said it before and I’ll say it again: Reading is reading. We talked a lot about stigmas attached to certain genres of literature in my Approaches to Literature and Culture class last semester and it all ultimately boiled down to a socially constructed divide between high and popular culture. This divide has been around for centuries in some form or another and it boggles my mind that people still get righteous and uppity about it today. For instance, we read this article written by Ruth Graham that was published by Slate in 2014. In the article, Graham argues that adults should not read books like The Fault in Our Stars by John Green because “if they are substituting maudlin teen dramas for the complexity of great adult literature, then they are missing something.” She asserts that young adult novels are inherently less complex than novels written for adults because the plights of teenagers are also inherently less complex than those of adults. In her mind, “great” literature and “complexity” are inextricably linked, though how she measures this enigmatic characteristic of “complexity” is yet to be explained. To me, Graham seems like the kind of reader who has likely said “Well, at least your reading something….” at one point. The idea that there is some sort of hierarchy of “great” literature is incredibly frustrating, especially when people are just reading for fun. Who cares if I read Faulkner’s The Sound and the Fury or John Green’s The Fault in Our Stars? I’ve enjoyed both novels immensely and see nothing wrong in being able to do so. This is one of the main reasons I try to read a wide variety of literature and reflect that in the book reviews I post on this blog. Reading is reading is reading and there’s nothing wrong with reading what you enjoy. I might be preaching to the choir here because most book bloggers I’ve interacted with are wonderfully accepting of what other people read. Nevertheless, I think this is a really important topic to keep in mind. Do you agree or disagree? What are some things people say about what people read that frustrate you? Let me know in the comments section below! Agree, agree, agree! I can’t stand book snobbery. So many people don’t read at all, and I just wonder how much of that is because they’ve been made to feel guilty or embarrassed for enjoying any book that they *have* picked up and have been discouraged from the hobby altogether. Enjoying a good story isn’t something that needs to be Ivory Tower’ed, if that makes any sense. And the constant leering down one’s nose towards the YA community is so exhausting. Children’s books can deal with as complex of subjects as adult books, and to say that one genre is inherently superior to another is to ignore the fact that *every* genre has clunkers, just as every genre has gems. No one should feel shamed or judged for their reading material. Definitely! You make a great point that there are fluctuations in every genre, not just YA or children’s lit. An excellent book is excellent no matter who its intended audience is. Good post. I think years back I might have felt like that too, but definitely not anymore. The worst thing is that this point of view is taught to us in schools, usually. We can’t help picking it up. Lately I’ve been learning though, that those ‘complex’ books are often just boring, or plain old pretentious. I don’t enjoy a lot of YA or romance myself, but I wouldn’t say that to people who like those. Because tastes are tastes, and we need them all. And complexity can only go so far… haha. That’s a really good point about this attitude being taught and fostered in schools. If only we could change that ASAP!